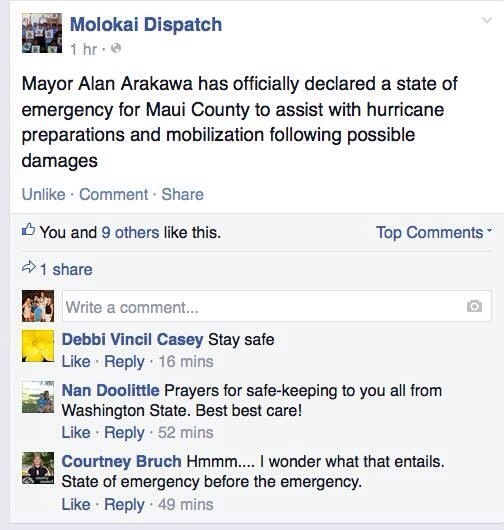 This was posted publicly on Facebook today by the Molokai Dispatch. Hawaii is under a hurricane watch and for someone who wants to be a politician, she doesn’t seem to have a clue about the basics of emergency preparedness. Are voters really going to trust her as leader if she is this clueless about some basic government functions??? This entry was posted in Uncategorized and tagged Courtney Bruch, Maui County Council, Molokai Dispatch. Bookmark the permalink.